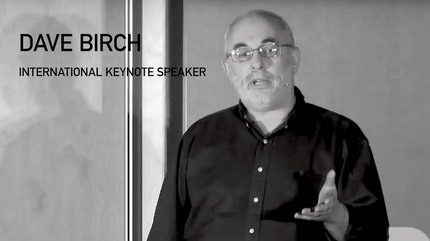 Sounds like standup comedy from the extraordinary @dgwbirch - but isn’t. I’m Dave Birch. I’m an author, advisor and commentator on digital financial services (and a few other things besides). I hope I’m known as a decent writer, an excellent public speaker, a recognised international thought leader in digital identity and digital money, a reasonable consultant, a great board-level advisor, a respected media commentator, a well-read blogger and an inveterate tweeter. I am the principal at 15Mb, my advisory practice, and Global Ambassador at Consult Hyperion, a leading consultancy in the field of electronic transactions. I’ve advised some of the world’s biggest banks, financial services organisations, telecommunications providers, IT companies and others about the future of electronic transactions. Emerging Payments Association Industry Contributor of the Year 2018. My most recent book “Before Babylon, Beyond Bitcoin” was chosen by American Banker as one of their “12 books for bankers”, and Prospect said of it that when a book comes along with glowing praise on its sleeve from Kenneth Rogoff and an introduction by Andrew Haldane, Chief Economist at the Bank of England, you know you’ve got something hot on your hands. This analysis of money by one of the world’s leading experts on the subject does not disappoint.